My father passed away very early this week. I mentioned this on Twitter already, but in case there are blog readers who don’t follow me on Twitter but who did read the last “Update, personal” post, I thought I’d mention it here too. I don’t really have anything more to say than that. The feelings are all pretty raw right now, as I imagine anyone who’s been through this themselves can attest. I do have a book release coming up next week, and though my promotional efforts will probably be kind of subdued, I’ll keep up with the giveaways. Thanks in advance for your understanding if I’m not at my public-relations best. Random.org picks commenters Malgorzata, Lesa Neace, and Jacqueline Watts! Malgorzata, Lesa, and Jacqueline, please email me at cecilia@ceciliagrant.com with a mailing address and I’ll get the books out to you. Everyone else, stay tuned for more giveaways. My month of housecleaning/giveaways continues! 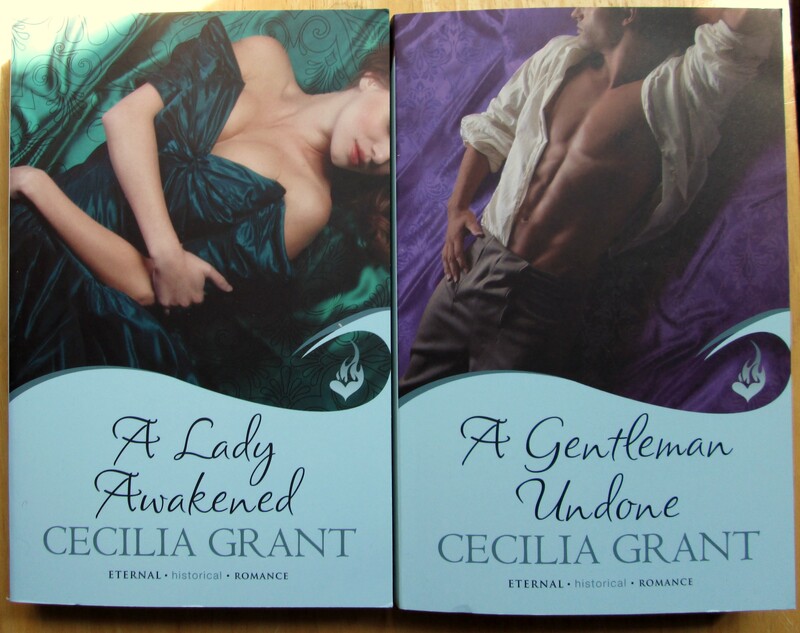 This time, there will be three winners, because I have three leftover Advance Reader Copies (or Advance Reader’s Editions, as my publisher prefers to call them) of my first book, A Lady Awakened. I don’t know why the books look so beat-up in this picture. They really aren’t. Those white marks on the bottom of the rightmost book are sunlight-glare. I would not give you beat-up books, not even for free. Leave a comment on this post (anything along the lines of “Please enter me in the drawing”) by 11:59:59 pm Pacific time on Tuesday, June 11 and you’ll be entered to maybe win one of the ARCs. This giveaway, too, is open to readers in all nations. Congrats to commenter #32, Karin Anderson, whom Random.org picked as the winner of my giveaway. 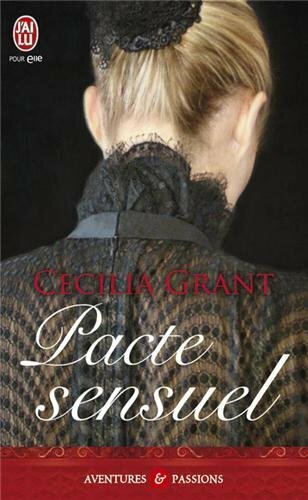 Karin, send a mailing address to cecilia@ceciliagrant.com and I’ll get the book out to you! I have one very early, pre-official-giveaway copy of my June book, A Woman Entangled, and nothing would make me happier than to give it to one of you. Wielding a deliciously sharp wit, Grant delivers yet another cleverly conceived and deftly choreographed Regency historical that is both lushly sensual and thoroughly romantic. 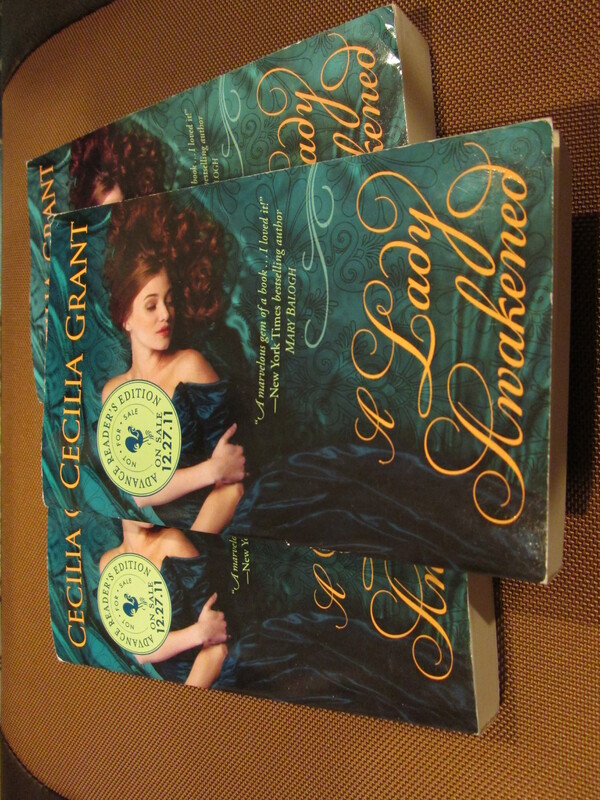 Readers who have yet to discover Grant’s impeccably written romances are in for a rare treat. So if you’re one of the readers who has yet to discover my books, or if you’ve read one or both and are curious about the next one, this giveaway is for you! Leave a comment below (as before, some variation on “please enter me in the drawing” is all I require) by 11:59:59 pm Pacific time Wednesday, June 5 for a chance to win. This giveaway is open internationally.